Set in 1950s Wales, the play opens with the discovery of the corpse of former big game hunter Richard Warwick in his own living room, by Michael Starkwedder, a mysterious traveller passing though who has got stuck in the fog. Warwick’s wife, Laura, stands over the body, pistol still in hand. Of course, this is Agatha Christie, so nothing is quite as it seems. This opening scene, although it should be exciting, is possibly the hardest going. As Starkwedder and Laura Warwick, Séan Browne and Kate Tydman struggle in their long, exposition-heavy exchanges. It is a shame this slightly wooden opener kicks off the play as it means everything drags for a while before really picking up steam. Later, however, some lovely performances, notably Alexander Neal as a hapless police sergeant, Diane Keen as the long-suffering Mrs Warwick senior, and George Telfer as the inscrutable butler, Angell, bring out the comedy and character of the piece. But nostalgic as the evening is, the play’s dated-ness makes it a tricky one to revive. The character of Jan, Richard Warwick’s half-brother, who has learning disabilities, is complicated by the attitudes of the time. It is lucky that a wonderful, sensitive portrayal by Luke Barton makes the part palatable for a modern audience. The dialogue is undoubtedly plonky and awkward at times, and the production’s unnecessary use of music at inadvertent intervals verges on the absurd. But this is Agatha Christie, not Angela Carter. If you fancy an evening of cutting edge, experimental, hard-hitting theatre, you might want to look elsewhere. 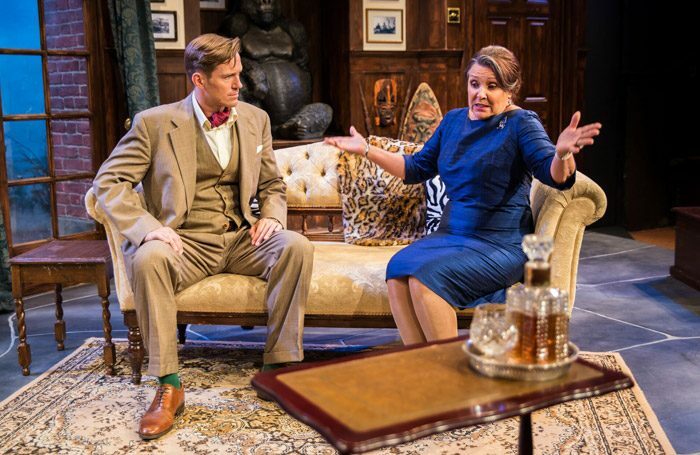 But if you want to see a British institution, directed by a British institution, in throughly British surroundings, The Unexpected Guest remains a ripping yarn and a jolly entertaining night. The Unexpected Guest runs through 28 July.